Via the Lottaliving forums, we learn that the midcentury 9900 Club is available for rent. The 9900 Club, a private club on Santa Monica and Charleville in Beverly Hills, was previously known as the Friars club until the Friars Club of New York gave their West Coast brethen the legal smackdown. 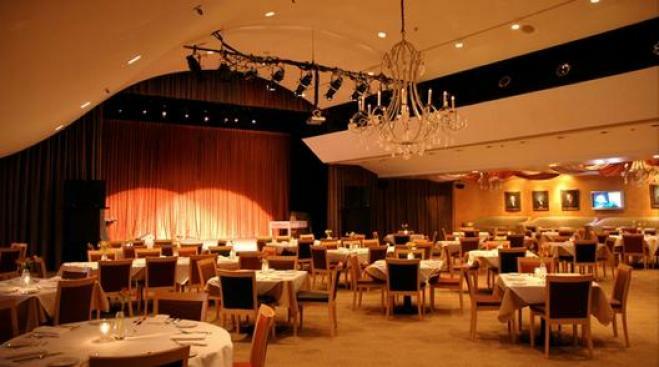 The club was built in 1961 by Sidney Eisenstaedt and according to the listing, claims the building "has undergone an extensive remodel, which has attracted some of Beverly Hills' most exclusive parties and events." And what would a Beverly Hills listing be without mentioning its Hollywood pedigree, although this one seems somewhat undiscriminating in lumping Sinatra with Larry Flynt and Jay Mohr: "Today, the walls of the club are lined with memorabilia celebrating such Celebrities such as Elvis, George Burns, Groucho Marx, Dean Martin, Larry King, Frank Sinatra, Sammy Davis Jr., Jay Mohr, Jeff rey Ross, Sebastian, Mark Meile, Larry Flynt, Jimmy Shubert, Waymon Teasdale, Sammy Shore, Lucy, & Desi, Hugh Hefner, Jeff Garlin, Red Buttons and hundreds of greats." The listing agent tells us it's available for $3.75 a square foot (depending how much of the 18,945 square foot space the renter uses).